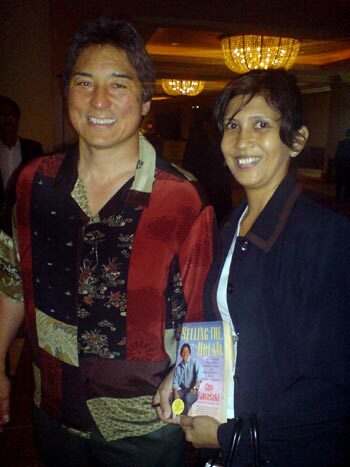 In a revelatory moment, a jetlagged but relaxed Guy Kawasaki candidly exclaimed that he regarded his four children as his greatest startups. Speaking at a WCIT 2008 event in Kuala Lumpur yesterday, he came across as an honest, “I hate to travel” family kinda guy — not the predatory venture capitalist you would expect from someone from the Valley. That hatred for travel way back in the 80s and the refusal to drive two hours to take up the offer of becoming CEO of then unknown and “undefensible” company by the unlikely name of Yahoo! may have cost him the Forbes’ billionaires list. “I had a kid and another in beta…” he says of his “bozo moment” which may explain why Guy still doesn’t ring a bell beyond IT circles, his one claim to fame being an evangelist for the Mac in 1984. Guy says he has yet to score the big deal that would qualify him as being a successful venture capitalist, and he thinks that as he gets older it all comes down to sheer luck. On reflection, he doesn’t think he would have invested in Google or eBay and he passed up on a startup that believed “drowning is a growth industry” and sold a roll of redtape as a solution, and now is raking it in. He amused us with some tales of crazy pitches, said he won’t buy an iPhone until it has 3G and Microsoft Exchange Server on it — highly contradictory after berating Windows machines and Bill Gates’ simultaneous holograpic presentation nearby — and that he wouldn’t take up the Apple CEO position, again because of, you guessed it — his four kids. One gets the impression that Guy is too much of nice guy to be in the cut-throat VC game. and download a similar Powerpoint presentation here. Caption for pic above: Guy and fan.